That is what people are saying today. We had all that snow last week, then a bit of rain. 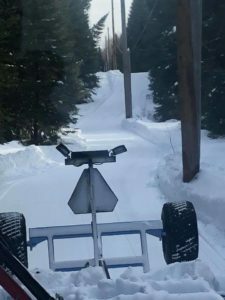 The groomers went out in our region, as well as surrounding clubs, making the trail probably the best they have been this season. Matt Stone posted some photos he took while grooming. Thanks Matt. Just a note: There is a lot of snow on Big Wood also plus some drifting so use a bit of caution riding out there. If you are ice fishing, you may need a shovel to clear the snow before you break the ice.